Sometimes an unexpected journey begins with one really great idea. Ashwin Shashidharan, a Ph.D. student in computer science at the Center for Geospatial Analytics, returns to campus this fall from a summer internship with the world’s leading GIS software company, after capturing the company’s attention with one of his greatest ideas. Now back at NC State, he continues to expand the research that landed him this prestigious opportunity. 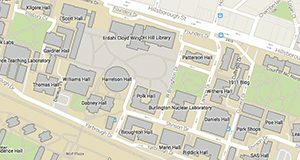 Last November, Ashwin won the 2016 Student Research Competition at ACM SIGSPATIAL’s international conference in San Francisco, for creating a new way to interact with and steer geospatial models in real time. Imagine being able to pause, play, rewind, and add new information to a model of urban growth as the model is running. That is exactly what Ashwin’s method allows you to do. Using so-called “computational steering” techniques to modify geosimulations on the fly had never been done before, and Ashwin’s award-winning work did not go unnoticed. Erik Hoel, the Utility Network developer lead and Geodatabase developer lead at Esri, was impressed with Ashwin’s research when the two met at the conference. One phone interview later, Ashwin was recruited for a three-month internship at Esri headquarters in Redlands, CA. There, he worked with a team of developers who previously created the ArcGIS GeoAnalytics Server. Ashwin focused on the computer science side of their research and development, testing new ways of using computer resources to run analyses more quickly and efficiently. The industry experience was very valuable, Ashwin says, and offered a potential stepping-stone to a career with the company. “Down the line, I would like to be able to teach,” Ashwin explains, and working with Esri would provide “a lot of scope for learning and professional growth” that would serve him well as a university professor. Looking ahead to the future, Ashwin has also expanded his initial award-winning work. 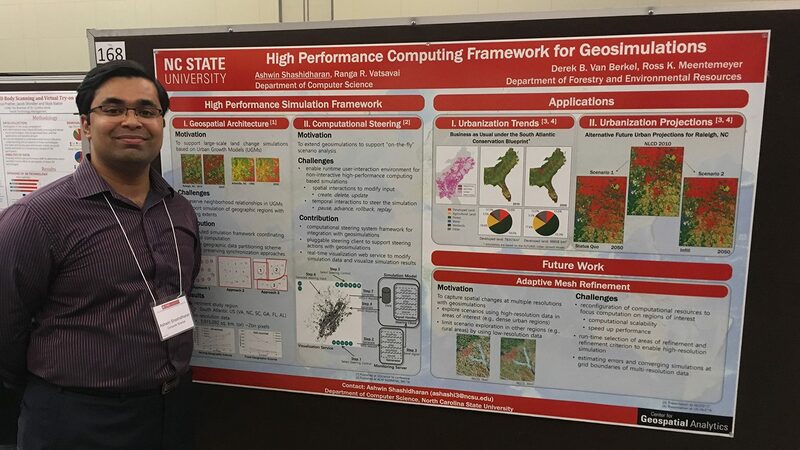 He has been accepted to present at another SIGSPATIAL conference in November, this time to unveil an even more powerful way to steer geospatial models, using distributed cores in a High Performance Computing (HPC) framework, to perform analyses faster and over larger spatial extents. As an undergraduate, Ashwin initially considered pursuing electrical engineering, but computer science and software engineering quickly appealed to his passion for creating tangible products and pursuing do-it-yourself work. Many engineering fields require very particular equipment, Ashwin explains, but computer programming means that “you can do it yourself, and anyone can be the head of a project. All you need are a great idea and a computer to code it to life.” Ashwin’s great ideas are taking him far, and he is passionate about teaching other students to cultivate their own. At the Center for Geospatial Analytics, Ashwin is jointly advised by Raju Vatsavai, the center’s associate director of spatial computing and technology, and center director Ross Meentemeyer. This post was originally published in Center for Geospatial Analytics.